I spent all of December 22nd reading The Last Centurion (a book by a friend of mine, John Ringo) and bidding on freelance jobs. I also did a little bit of Christmas shopping. My girlfriend went back to her hometown to be with her family for Christmas. My best friend was spending all his time with his girlfriend, as he hadn’t seen her since school began. I was having trouble getting ahold of him. I felt like I had next-to-nothing to do. I mean, there’s always blogging, participating on forums, songwriting, and just plain ol’ writing. But I had writer’s block, and blogging and talking on forums just didn’t feel like work. There’s this grasshopper who spends all his time fiddling around and having fun. It’s summer, so hey, why not? It’s warm and there’s plenty of food. He comes across these ants who’re preparing for winter, storing food in their hill. Man, they’re working hard. So the grasshopper sits down by the hill and starts making fun of them. Okay, so you get the gist. The grasshopper’s goofing off and just kinda’ being a douche. At least, that’s the way I’m telling it. Point is, he likes wasting time more than working. Working is anathema to him. Not only that, but he’s really, really short-sighted. Winter comes, of course, and the grasshopper finds himself quite cold and quite hungry. He happens to come across his little ant-friends again. Then the grasshopper freezes and/or starves to death. As The Last Centurion is about a post-apocalyptic United States, the “ants” are those who start to rebuild the best they can after things start going downhill and the “grasshoppers” are those who sit around waiting for someone else to fix it. The “ants” like to work. The “grasshoppers” hate it. Hey, I thought, maybe I should start reading about Africa a little. I’ve been meaning to do that for a while. Only problem is I’m pretty sure I would feel the need to sign up for the Peace Corp after just a couple books. This illustrates my need for a solid, detailed plan. Without one I start whipping around in the wind. Grinding my gears. Spinning my wheels. Being what I had just learned (from The Last Centurion, of course) to call “active/stupid.” While my long-term plan has always been to address hunger in developing countries in some way, I hadn’t even found my feet yet. It’s impossible to make any progress if you haven’t even found your feet. So I set about finding my feet. My subconscious was chewing at the problem already. I knew this because I kept having dreams. Like the one where I was in Goodwill. I kept finding all these awesome things, and I would put them in my cart and get in line. After a couple seconds, though, I would get distracted by something and wander off. When I got back, my cart was gone and so was all my stuff. So I went out to find more things, got in line, got distracted, etc. The dream just kept on going until I woke up. Like I said, “whipping around in the wind.” But as I alluded to in my last post, a plan was already forming. Is already forming, if I’m honest. I have only the barest of ideas as to what that plan might end up looking like. I’ll probably just pull something out of the air and go with it, because I really have nothing solid to go on right now. Well, I guess we’ll see what I’ve come up with by Wednesday, won’t we? 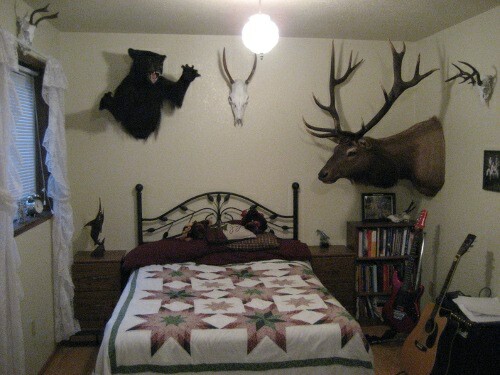 Yeah, my girlfriend’s dad is a hunter. First, the bedroom made me giggle. All those animal heads staring down at you…? Creepy. And I’m a hunter. I wonder if the dad did that on purpose to scare the bejeezus out of you!